Many baby boomers will fondly remember Fireball XL5, a space-themed 1962 puppet TV series (pre-Thunderbirds) that was produced by the husband and wife team of Sylvia and Gerry Anderson. In Australia it appeared on TV in 1963 and in the US it was screened on Saturday morning TV between 1963 and 1965. 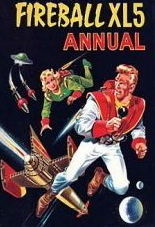 In keeping with popular sci-fi themes of the era, the show was futuristic, set in the years 2062 and 2063 and focused on the missions of spaceship Fireball XL5, part of a world fleet commanded by jaw-jutting puppet hunk Colonel Steve Zodiac of the important sounding World Space Patrol. Space Patrol's revolving Top Level headquarters was based in Space City and headed by Commander Wilbur Zero, aided by his assistant Lieutenant Ninety. The Patrol's job was to keep an eye on Sector 25 and protect the Earth from any potential threat from Alien invasion. The three hundred foot long XL5 came equipt with a nose cone accesory - Fireball Junior, which was a handy small ship for convenient landings. In addition to Zodiac, the crew consisted of blonde bombshell, Dr. Venus, who specialised in space medicine; engineer and navigator, Professor Matthew Matic, a robot co-pilot called Robert and a telepathic pet Lazoon called, appropriately, Zoonie. There were also some minor characters which included Eleanor Zero, wife to the Commander, their son Jonathon Zero; Space City's chief engineer, Jock Campbell, underground green nasty pasties from Planet 46 and regular bad guys Boris and Griselda from the Spaceship SS Thor. Many of the voice-overs were done by Sylvia Anderson and Robert the robot pilot was voiced by Gerry Anderson through a larynx machine. Fireball XL5 was noted for it's theme song - written by Barry Gray(who also wrote the theme for Thunderbirds) and performed by Don Spencer - which became a semi-hit in the UK. There was also merchandising in the form of toys, comics, rocket playsets and four Fireball XL5 annuals, all of which are now collectors items.